We have investigated the effects of dipping time, solution concentration and solvent type on the formation of self-assembled monolayers with aminosiloxane molecules (i.e.,N-(3 trimethoxysilylpropyl)diethylenetriamine (TPDA)) on the Si(001) surface. Studies performed with an ellipsometer showed that monolayers with a thickness of about 1.2 nm were formed when the dipping time is about 2 h, while multilayer were observed for longer time periods. The effect of the TPDA concentration on the thickness of the deposited layer was not very profound, however, the contact angle data exhibit importance of concentration on the surface coverage. The type of the solvent used in the formation of the monolayers was found an important parameter. Monolayers were formed with solvent having larger dielectric constants. Relatively thick multilayer was observed when benzene was used as the solvent, due to its quite low dielectric constant (hydrophobicity). Self-assembly has recently emerged as a new approach in chemical synthesis, nanotechnology, polymer science, materials science, and engineering. Molecular self-assembly systems lie at the interface of these disciplines and many self-assembling systems have been developed. Self-assembled monolayers (SAMs) are a class of molecular assemblies that are typically prepared by exposure of a surface to molecules with chemical groups that possess strong affinities for the substrate. The driving force for the formation of the monolayer includes chemisorption of functionalized molecules on the substrate surface, and the intermolecular interactions. Due to their ease of preparation and controllable surface chemical functionality, SAMs represent suitable model systems for studying wetting [1–3], corrosion [4, 5], adhesion [6, 7], tribology [8–12], charge transfer through molecules , and model surfaces for biochemistry and cell biology . Other applications (resistance to etchants  and protein adsorption, modified electrodes for electrochemistry) rely on the ability of SAMs to prevent diffusion of other molecules to the surface of the underlying substrate . The final morphology and thickness of a SAMs are reported to be extremely sensitive to experimental parameters including the type of precursor molecule, concentration, type of solvent and its quality, temperature and reaction time, etc. Despite several experimental investigations dedicated to the grafting of organic molecules to the silicon surface, there are only few description of such grafting and fewer attempts to understand the self-assembly formation. In the present work, SAMs with amino end group were prepared by usingN-(3-trimethoxysilylpropyl)diethylenetriamine (TPDA) molecule on the Si(001) surface. Effects of dipping time, solution concentration and solvent type on the formation of TPDA on Si(001) have been investigated. Subsequently, thicknesses and water contact angle of each film were measured using imaging ellipsometry and contact angle goniometer, respectively. The substrates used in these experiments were Si(001) wafers (n-type, obtained from Shin-etsu, Handoutai, Japan). The substrates were cut into 5 × 5 mm pieces for further modification. The substrates were first cleaned by repeated rinsing with deionized water and ethanol. They were then further cleaned a mixture of NH3 (25%, v/v), H2O2 (30%, v/v), and deionized water having a volume ratio of 1:1:5 at the temperature of 70 °C during 20 min. Afterward, the substrates were washed with ethanol and dried under nitrogen stream. Finally, these substrates were exposed in UV/ozone chamber (Irvine, CA: Model 42, Jelight Company Inc. USA) for 15 min prior to modification in order to remove hydrocarbon and to produce a hydrophilic surface. For this cleaned surface, the water contact angle was about 3°. The lower contact angle obtained is consistent with the presence of increased number of hydroxyl groups on the cleaned surface . Unless otherwise stated, freshly prepared TPDA (Aldrich USA) solutions (0.25, 0.5, 1.0, 2.0, 4.0, and 8.0%, v/v) in absolute ethanol (Aldrich USA) were used for the monolayer formation. Silicon wafers were dipped in the TPDA solution of particular concentrations and were removed from solution after selected time intervals. Static water contact angles of the sample surfaces were measured at 25 °C in ambient air using an automatic contact angle goniometer equipped with a flash camera (model DSA 100, Krüss, Germany) applying the sessile drop method. The volume of the drop used was always 1 μL in all measurements. The contact angles are calculated by using the software of the instrument. All reported values herein are the averages of at least nine measurements taken at three different locations on each sample surface and have a maximum deviation of ±1°. The vertical structures of the samples, especially the (optical) thickness of layers were also measured by means of an auto-nulling imaging ellipsometer (Nanofilm EP3, Germany). All thickness measurements have been performed at a wavelength of 532 nm with an angle of incidence of 72°. In the layer thickness analysis, a four-zone auto-nulling procedure integrating over a sample area of approximately 50 × 50 μm followed by a fitting algorithm has been performed. In the analysis of the hydroxylated surface and the SAMs formed on it, a four-phase model consisting of silicon substrate/SiO2/overlayer/air is assumed. The designed overlayers are assumed to be transparent; a generally reasonable approximation for organic layers with C-chains . Since the thickness and refractive index are highly correlated for very thin films (less than 10 nm), refractive index of the overlayer can be reasonably assumed and then thickness of the overlayer can be determined. Refractive indices as 3.8650 for Si substrate, 1.4605 for the SiO2 layer and 1.4600 for the TPDA layer in the model have been applied. We have firstly looked at the effect of dipping time on the formation of TPDA molecules on the silicon surface. Dipping time has been reported as one of the most important criteria for the formation of alkoxysilane molecules i.e., TPDA [19, 20]. The effect of dipping time on the formation was investigated by using 1% (v/v) TPDA solution in absolute ethanol within various time intervals (0–24 h) at room temperature. The chances both in the thickness and water contact angle of the Si(001) surface due to attachment of TPDA molecules, with the dipping time are given in Fig. 1. As seen here, the film thickness is observed about 1.2 nm during the first 2 h. We also calculated the theoretical molecular length of TPDA molecule by VASP (Vienna Ab initio Simulation Package (VASP)), and found as 1.39 nm. It seems that, in the first 2 h, the TPDA molecules are forming nice monolayer on the silicon surface. However, increasing the dipping time over 2 h, result significant increases in the thickness, which may be explained by multilayer formation. Multilayer formation may be discussed in two alternative or parallel processes. In the first one, we can assume that, TPDA molecules react rapidly with water in the solution to form TPDA oligomers. However, complete polymerization in two dimensions may not be possible due to the space constraints imposed by the chain. When the oligomers diffuse onto the substrate surface, they may be adsorbed first by simple physical interaction, and then, they do react with the substrate surface groups chemically, i.e., by elimination of water and formation of Si–O–Si bonds to the substrate, as also mentioned in the related literature . The alkyl chains of the oligomers may be closely packed in order to minimize their energy via van der Waals interactions on the substrate surface. The driving force for this step is lateral interaction between oligomers (two-dimensional condensation). Therefore, there will be residual silanol (Si–OH) groups dangling from the two-dimensional network, which result chemical bonding on the substrate surface. These structures which are formed more than one TPDA molecules (oligomeric structures) may be considered as multilayer (see Fig. 1). In a parallel second type of process, the amino groups in the aminosilane molecules (TPDA), i.e., –NH2 and –NH–, may form a hydrogen or ionic bond with a methoxysilane group or its hydrolysis form, i.e., Si–O–CH3 or Si–OH, respectively, in another aminosilane molecule, or in other terms they do form the two-dimensional network of the oligomers aggregates which diffuse onto the substrate surface, do directly interact with the functional groups of the substrate (in the unoccupied areas) or via interaction with the TPDA molecules that are already formed monolayers, which is also an important alternative pathway for the formation of multilayer on the silicon substrate surfaces [22–24]. Unfortunately, with the experimental set ups in our study and also used by others, it is not possible to exhibit the exact processes for the formation of multilayer, or relative contributions of the two alternative processes discussed above. The contact angle of water is sensitive to the polarity of the surface and may be used as an indication of hydrophilicity. The change in the contact angle has been used to describe roughly the variation in surface chemical composition of the substrate as well as the extent of the surface coverage . 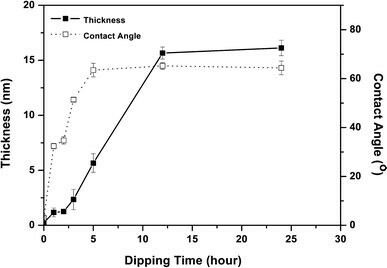 Figure 1 shows the variation of contact angle of the hydroxylated Si(001) surfaces as a function of dipping time in the TPDA solution, which were obtained in this study by using a sessile water drop technique. A clean Si surface has usually a contact angle less than 15–20°, which indicates its hydrophilic nature. As seen in Fig. 1, there was a steep increase in contact angle values when we were interacted these hydrophilic surfaces with the TPDA solution, due to hydrophobic chains of TPDA molecules (or oligomeric forms discussed above). Longer dipping times resulted higher contact angles, but a plateau value was reached around a dipping time of 12 h, which, most probably correspond full coverage of the substrate surface, as also discussed in the related literature recently [25–27]. For example, in the case of 1% (v/v) TPDA solution, the contact angle values are 33° and 52° for a dipping time of 1 and 3 h respectively, whereas the steady state value is 65 ° ± 2.1 (for a dipping time of 24 h) indicating the full surface coverage of TPDA molecules. These data are in good agreement with the contact angles measured for water on amino-terminated layers reported in the literature, which were in the range of 23–68° . Figures 2a, b and c exhibit the ellipsometric 3-D images of the surface morphologies of the hydroxylated Si(001), and the two examples treated with TPDA for two different dipping times of 2 and 24 h, respectively. The surface images of the TPDA interacted ones (dipped in TPDA solution for various time intervals) are considerably different from the original hydroxylated silicon surface. The yellow color in Fig. 2b demonstrates, most probably the TPDA monolayers covering a large part of the substrate surface. The red regions may be the ones containing already some TPDA but they are relatively much lower percentages, therefore the average thicknesses measured (see earlier discussions) are in the level of monolayer coverage. However, for longer periods of dipping (24 h), the substrate surface is almost fully covered, and with multilayer (the red color) as seen in Fig. 2c, which is correlated with the findings demonstrated in the previous paragraphs. The effect of TPDA concentration on the film thicknesses and water contact angles on the hydroxylated silicon surface were studied by using different concentration of TPDA solutions (0.25–8%, v/v) in absolute ethanol within 2 h at room temperature. As seen in Fig. 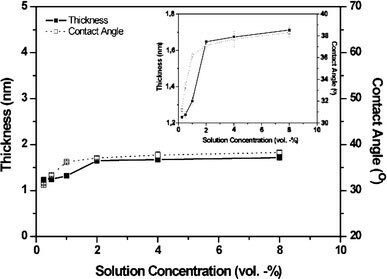 3, the film thickness increases with the solution concentration, but not significantly. The average thickness found with 0.5% of TPDA solution was about 1.24 nm at, while it was in the range of 1.64–1.71 nm reached with the TPDA solutions of 2–8%. It seems that all the surfaces obtained with different TPDA concentrations covered only with monolayers. It should be noted that the dipping time was constant (2 h) in all treatments. Figure 3 also shows, in contrast to changes in the thickness, the variation of water contact angle of the Si(001) surfaces as a function of the TPDA concentration after treatment is quite significant. For example, in the cases of 0.5 and 2% TPDA concentrations, the contact angle values were 33.2° and 37.1°, respectively, while the difference at higher concentrations were not very significant and about 38 ° ± 0.4 (for a solution concentration of 8%). It seems that a 2% TPDA concentration was enough to form a monolayer covering the whole surface of the substrate in 2 h, which corresponds a contact angle value of 38°. Self-assembly is the process by which monomeric molecules recognize each other in solution and form aggregates of complexity ranging from dimers to the mesoscopic-size structures. The intermolecular forces that make molecular recognition possible are very often dependent on the solvent. For instance, an assembly held together by hydrogen bonds may not be stable in hydrogen bonding solvents such as water and alcohols. On the other hand, complexes using the hydrophobic effect as their driving force usually dissociate in hydrophobic organic solvents . In our study, the self-assembly formation of TPDA molecules on the hydroxylated silicon surface were investigated by four different solvents: ethanol, acetone, THF and benzene. In this group of studies, the TPDA concentration and dipping period were constant, i.e., 1% (v/v), and 2 h, respectively, and interactions were performed at room temperature. Table 1 shows the thickness and water contact angles of reached on the Si(001) surfaces treated with TPDA solutions in four different solvents. Measured thicknesses of films prepared in ethanol, acetone, THF and benzene were observed to be 1.45, 1.90, 2.86, and 14.70 nm, respectively. Water contact angle values for films prepared in these solvent were also found as 37.4, 39.1, 41.2, and 57.7°, respectively. Note that the thickness and contact angle values were in parallel, and very close values were obtained with the first three solvent, while the values for benzene were quite different. These results may be attributed to dielectric constants of these solvents. Ethanol, acetone, THF, and benzene have dielectric constants of 24.3, 20.7, 7.52, and 2.28, respectively. In our case, comparatively much higher thickness and contact angles reached with benzene may be explained as follows: Solvents having a dielectric constant much higher than 4 (as the first three solvents in our case), tend to dissolve the hydrophilic head-groups of the SAM forming molecules (in our case TPDA) within the medium and allow the formation of SAM on the hydroxylated silicon surfaces . On the other hand, solvents having a dielectric constant lower than 4, oppositely may force the TPDA molecules to form reversed micelles or network structures in the solution therefore reducing the concentration of the hydrophilic TPDA head groups in the medium which prevents SAM formation. Most probably larger structures are formed in benzene, due to its rather low dielectric constant (or hydrophobicity) and they accumulated on the substrate surfaces rather as multilayer. The ellipsometric 3-D images given in Fig. 4 support these discussions. 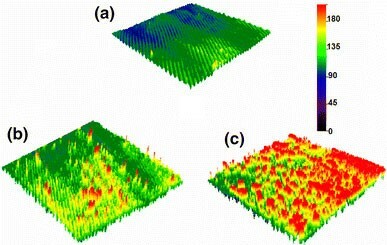 The images of the surfaces obtained with THF and acetone (Fig. 4a and b) clearly shows that the surfaces are not fully covered but seems that they are monolayers. However, in the case of benzene, the substrate surface is almost covered and with a multilayer. Amino-terminated self-assembled monolayers are currently used commonly in both industrial and research-oriented applications. Unfortunately, there is no clear and accepted explanation of the formation (neither the mechanisms nor the conditions) of SAM and/or multilayer on substrate surfaces. In this study, we have selected a well known surface, an hydroxylated Si(001) and investigated formation of SAMs (and or multilayer) of again a widely used precursor molecule, i.e.,N-(3-trimethoxysilylpropyl) diethylenetriamine (TPDA) on these surfaces at different conditions. The dipping time was first parameter investigated in this study. 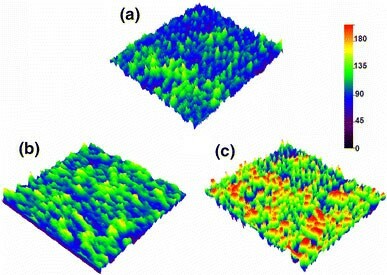 Monolayers were formed in dipping times shorter than 2 h, longer periods resulted multilayer. In the experimental set up we were not able to analyze the multilayer structures. It was not also possible to describe the formation mechanisms. Two alternative pathways, formation of oligomers and then adsorption and reorientation (two-dimensional networking) on the surface is one of the mechanisms that one can propose. The other one is the formation of oligomers and their aggregates in the solution and then their adsorption onto the substrate surface as multilayer. Most probably, both mechanisms are occurring, but which one is contributing more we do not know, we are currently working on designing new experimental strategies to explain this behavior. It was observed that the precursor concentration within the dipping medium does not effect the thickness of the layers, however the changes in the contact angles with the solution concentration was significant and interestingly related to the surface coverage of the substrate. The type of the solvent was found an important parameter to control the monolayer formation. It seems that compatibility of the precursor molecules and solvent is important. If one selects the correct solvent, monolayers (or multilayer) with desired orientation can be reached, however this needs also further studies, which are under-investigation in our group as the extension of this study. Authors would like to thank Gökçen Birlik Demirel for theoretical calculations. Gökhan Demirel was supported as a post-doctoral fellow by TÜBİTAK. Prof. Erhan Pişkin was supported by Turkish Academy of Sciences as a full member.